Course overview | Demonstrations and discussion about keymaking, repair of broken keys and replacement of missing keywork. Topics covered will include material selection, making your own tools, jigs and fixtures, hard soldering, surface finishing, and the use of castings and casting preparation. Through working with both Howarth’s and with Duncan Crawford, Peter has refined the art of woodwind instrument design with focus on mechanisms of oboes, clarinets and flutes. 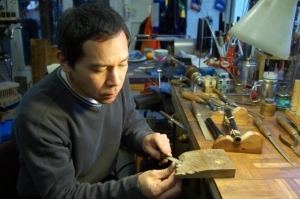 A highly accomplished key maker and craftsman, he now focuses on making entire flutes, though his recent invention of a clarinet that can be played by someone with only a functioning right or left hand is a tour-de-force and ranks him in the top echelons of instrument designers and technicans. Peter also gets involved behind the scenes at Cambridge Woodwind makers and is a valuable part of the organisation. The course fee covers all the materials, use of tools and expert tuition. It also includes lunch and light refreshments. Abilities | Of particular interest to woodwind instrument makers and repairers. Suitable for adults and students over 16 years old; musicians, artisans and craftspeople.